There are lots of great stories in footy; some obvious – like Premierships, great careers, wins from behind - and then there are some that you have to think about a bit more, like when a player is discarded by one club, and goes on to be a star somewhere else. The Matt Clape story fits squarely into this latter category. Originally from East Perth, Clape was a lively, mid-sized forward who played 29 matches for the West Coast Eagles between 1992 and 1994 without claiming a place in either of their two Premiership teams. Despite misgivings among the Eagles’ coaching staff, he was then delisted, and picked up by the Blues in the 1995 Pre-Season Draft, along with Glenn Manton from Essendon. Both proved to be great acquisitions, and key players in the mighty 1995 Premiership win by Carlton over Geelong. At first Clape was groomed as a defender by the Eagles, but couldn’t cement a regular place in their team that was rich in similar types. When he played only six matches in 1994 it seemed obvious that his time was up with the Eagles, although coach Mick Malthouse later admitted that after Matt was discarded, he hoped that the decision “wouldn’t turn around and bite us on the bum,” which indeed it did. In his very first match for his new club, against Collingwood at the MCG in round 1, 1995, Clape turned in a blinder and picked up three Brownlow Medal votes in a big win for the Blues. Wearing guernsey number 6, and playing from a half-forward flank alongside captain Stephen Kernahan, his three goals and unselfish support play made him a unanimous choice as Best on Ground. He followed that up with five goals from a forward pocket against Fitzroy in round 2, and was consistently good throughout the rest of the home and away season – highlighted by another big effort in round 15, when he almost single-handedly tore the Crows apart at Optus Oval, kicking seven goals straight from 17 quality possessions. Throughout that unforgettable year, Clape could be found at half forward or in the pocket, rotating around the established stars in Kernahan, Earl Spalding and Brad Pearce. With this potent attack, sharpened further by a resting Greg Williams or Dean Rice, there was always going to be plenty of opportunities for a quick and determined flanker who was capable off either foot. He missed only two games all season, and capped it all off with another strong effort - gathering 19 quality possessions - in Carlton’s crushing victory over Geelong on Grand Final day. Largely because of his exploits in 1995, but also because of his consistency through the early part of the year, Matt was honoured further when he was included in the WA State of Origin team that met South Australia at Football Park in June, 1996. The game was a willing contest, and both sides had the same number of scoring shots - but SA was more accurate when it counted and won by 35 points; 20.6 (126) to 13.13 (91). From the heights of Premiership glory in 1995, Carlton faltered to fifth place in ’96, while injury began to take its toll on Clape’s body. After the interstate game, ankle and calf problems appeared, restricting him to 17 games for the year and sidelining him from the Blues’ horrific Semi Final loss to Brisbane. On top of that, he hurt a knee in 1997, struggled through eleven games, and by the end of the year was spending long periods on the interchange bench. Although he played on into 1998, Matt’s best days as an AFL footballer were behind him by then, and his cause wasn’t helped by the slump in Carlton’s fortunes. By round 9, Carlton had won just once, and our next-up clash against the likewise battling Brisbane Bears at Princes Park was billed as an early elimination final – because the losing coach; either David Parkin of Carlton, or John Northey of the Bears – seemed certain to be sacked if they lost. As it turned out, Matt Clape played his last game for Carlton that afternoon, running off the bench on the day after his 29th birthday, and coincidentally, helped to condemn Northey to oblivion with a four goal win. After leaving Princes Park (with an assurance that he was welcome back at any time) Clape went back home to WA to play out his career with East Perth. Later he moved into a role as assistant coach, and in 2008-09 was in charge of the Royals’ forward structure. Didn’t take the high mark or kick the long goal. Couldn’t run out of sight on a dark night by the end of his career (due to injury). Wasn’t able to play many games for Carlton upon his move across the Nullarbor from the West Coast Eagles. This is however where statistics combined with ignorance serve to diminish the contribution of an athlete to his team. Although his level of skill was high across all facets of the game it was his ability to selflessly execute the team-based aspects of the game that stood him apart. 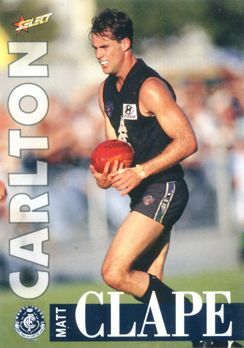 There is little doubt that Carlton ’s strong showings mid-nineties were the result of one M. Clape taking the heat off many of his more regarded team-mates. Contributors to this page: PatsFitztrick , molsey , Bombasheldon , WillowBlue , Jarusa , dgreen2 , BlueWorld , true_blue24 and admin . Page last modified on Sunday 17 of May, 2015 10:50:09 AEST by PatsFitztrick. 1995 Rd 1 - Brad Pearce in pursuit of the footy. 1995 State of Origin - Rod Austin & Gary Ablett hold up the cup.